Not Fishing After Sunday Until The Next Announcement. Adding Sunday to the trip list. Weather man's cutting us a little break. Thursday's inshore trip ended with quite a few limits (10 angler trip) & many female releases. 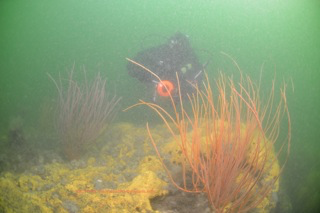 Working with two big names in conservation on a sea bass habitat grant. Big pot of money in my world. Applying for a grant is something I've rarely been successful at. Maybe too honest? If you think fishermen stretch the truth, you ought to see some of the numbers getting thrown around in grant proposals. . . Readers already know I believe we need to understand how much habitat's been lost -and where- before we can undertake an actual "restoration." If a mansion burns to the ground and we pitch a pup-tent next county over, is that a home restoration? Pretty sure that's where we're at with Mid-Atlantic seafloor habitat now. Everyone seems to get the sea-grass (SAV) & oyster thing in estuaries. Seafloor off here is, and I quote, "sand & mud." Actually, I'm not so sure our 'recreational angling community' really get the estuarine stuff either. Promise: The better habitat gets, the more fish populations will have room to grow. Have a fishing area off the coast called the Bass Grounds. I've been told skippers of yesteryear rarely had to anchor to catch sea bass, it was a drift fishery. By contrast, most of my sea bass trips over three and a half decades, including those with Capt. Orlando Bunting, have been at anchor. Not all, but most. I have friends who fished for marlin at the Bass Grounds too. One won the big Marlin Club tournament in 1958 I believe it was.. When I was 19 I was sent to the "Tackle Shop" on a windy day to "Get A Book Of Hooks." No, old Capt Orie Bunting wasn't fooling his bookkeeper when he sent me out for vodka. When I came back, another old skipper & Capt. Orie were in a mood to tell tales. They told me about when the African Queen sank, other boating accidents important in local lore.. The other skipper told me something too I'll never forget: "We had the best sea bassing on the coast, and we let them destroy it." I knew he was talking about the Bass Grounds (AKA 1st Lump) & hydraulic clam boats, but it would be a long while before underwater video allowed me a better idea what had happened. It's happened to me too, I've witnessed several pieces of reef bottom lost to gear impacts; but never in such grand scale as these old timers must have seen..
Wasn't too many years after getting that 'box of hooks' when that other old skipper took a walk in the woods back behind his house. He sat down by a tree with a shotgun & never came home. Gonna put that reef back. Not a new idea. Been working on it. See email from 2001 below..
Scheduling and weather finally allow the first of many runs this winter for the Titan America. Towing the Apple Marine barge she will be departing the by dock mid-morning, weather permitting, with a load of sectional barges donated by McGinty Marine. Estimated time of sinking is 11:00 to 2:00 at the NW edge of the Bass Grounds Reef Site. Look for lots of materiel at this site this winter, predominantly concrete pipe. If the ocean is as calm as it was today, perhaps some of you can zip out there and get some pictures!